This is a awesome watch on a daily basis and works perfectly. It is easy to set up, and the watchband is very soft and comfortable. Digital and Quartz movement with Solar Power. 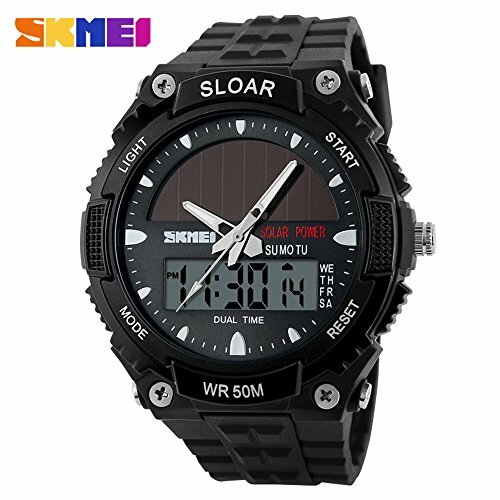 Great watch with analog and digital dual time display,makes it easier to read the time. Functions:This wristwatch have multiple functions, including Backlight, 12/24H Format, Alarm Clock, Month and Date, Chronograph, Hourly Chime. 50M Waterproof:Professional 50M waterproof level, enjoy swimming, seaside, washing hands, walking under rain and daily waterproof activity with the smart sports watch happily.NOTE: please DO NOT press any buttons in the water. The band is made of rubber, soft and comfortable to wear,senior resin mirror surface, high transparency, compressive and abrasion.